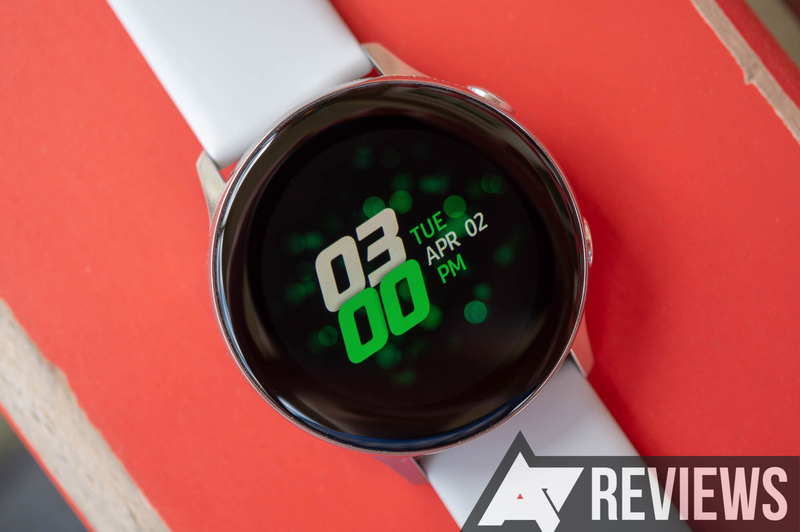 Design Chamfered edges around the screen, a nice metal body, tactile buttons, and support for standard 20mm bands make the Galaxy Watch Active feel like a more expensive smartwatch. Software Tizen is fast and responsive. Battery life I was able to get two days of use with the screen always on, and it only lost around 10-15% battery life after a full night of sleep tracking. 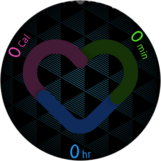 Health features Activity tracking mostly worked in my testing, and it's neat to see my heart rate instantly whenever I turn on the watch. Design (again) There's no rotating bezel, a staple of Samsung watches. The watch also has a large border around the screen and no speaker. 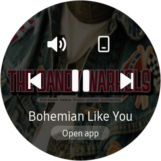 Software (again) There are very few third-party apps and watchfaces available, notification management isn't as nice as on Wear OS, and Tizen has a few quirks. Connectivity This doesn't have LTE, or MST for Samsung Pay. While the Galaxy Watch (and the Gear watches before it) are designed to resemble a traditional timepiece, the Watch Active looks far more like an Apple Watch. It has a metallic body, and the display's chamfered edges give it a more premium feel than the Fossil Sport. As a quick note, I'll be directly comparing the Watch Active to the Fossil Sport quite a bit here, since they're both health-focused wearables, and the Sport is the closest thing to a 'flagship' Wear OS device we have right now. Back to the Watch Active. The screen is pretty small as far as smartwatches go, at just 1.1 inches (28.1mm) across. For comparison, the Galaxy Watch had a 1.2 or 1.3" screen (depending on the version) and the Apple Watch Series 4 has a 1.78" screen. I wasn't able to find an exact size for the Fossil Sport's screen, but the display on my 41mm model is bigger than the Watch Active's. On the right side are two buttons. 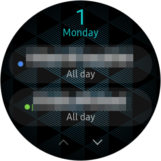 The top is a back button, and the bottom one takes you directly to the watch face. By default, double-clicking the bottom button opens Bixby, but you can change it to many other functions — like setting an alarm, opening an app, creating a reminder, and more. The back of the watch is mostly glass, with a heart rate sensor in the middle. The Galaxy Watch Active charges wirelessly, but as Android Central points out, it doesn't work with most standard Qi chargers. You're stuck using the included charger, or one of Samsung's first-party pads. As nice as the Watch Active design is, I do have two major complaints. The first is that there is no rotating bezel, which has been a signature feature on Samsung's watches for years. I'm sure this was a cost-cutting measure to get the watch below $200, but coupled with the small screen, it makes navigating menus and apps far more tedious. I've come to really enjoy the digital crown on my Fossil Sport. The other issue is that the bezels around the screen take up a good chunk of the overall watch body — by my rough math, the screen-to-body ratio is 71%. This is likely a consequence of making the overall watch smaller (you can only shrink the display drivers so much), and some people won't mind, but it makes the watch look a bit less modern than the Fossil Sport. 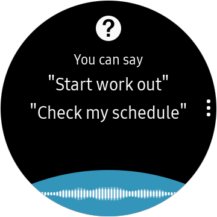 Another downside to the Watch Active is the lack of a speaker, so you can't answer calls or do anything like that. I don't personally care, but I know there are people that like answering calls on other wearables. On the bright side, the Watch Active's battery life was very good in my testing. Even with the always-on screen enabled, I could squeeze out two days of usage. With that feature turned off, you can easily go several days without a charge. For comparison, my Fossil Sport usually only lasts one day. For payments, the Galaxy Watch supports NFC through Samsung Pay. MST support is unfortunately missing, but it also wasn't present on the regular Galaxy Watch, and the number of stores lacking support for NFC (at least in the United States) is fairly small at this point. However, I wasn't even able to test NFC payments, since the model I purchased is an international variant that isn't compatible with the US version of Samsung Pay. 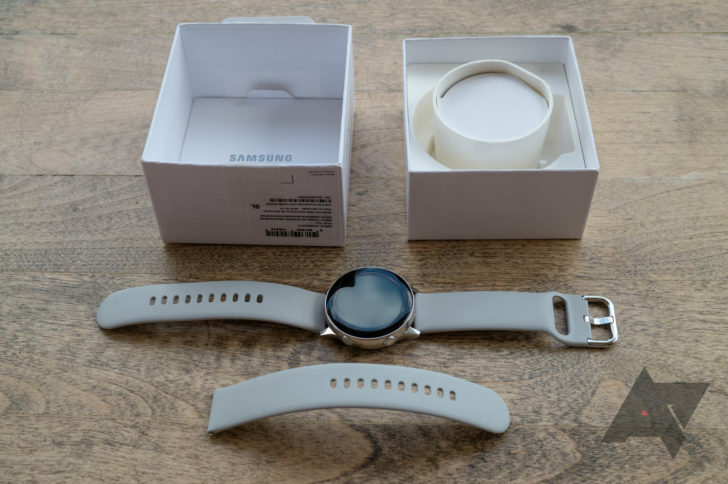 The included watch band is made of silicone, just like the band on nearly every other sports watch. However, it uses the same pin-and-tuck mechanism as the default Apple Watch band, which I'm definitely not a fan of — it feels like the extra length is digging into my arm. Thankfully, the Galaxy Watch Active supports any standard 20mm band, same as last year's Galaxy Watch. It's confession time: I've never used a Samsung smartwatch running Tizen before. 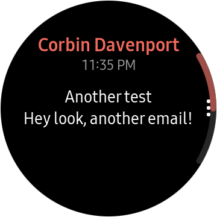 I initially bought the Watch Active specifically so I could compare Wear OS to Tizen, and to see if the high praise my colleagues at Android Police have given the platform was warranted. 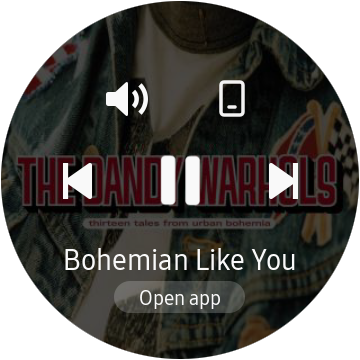 I've used Wear OS almost since day one, so Tizen took a bit of getting used to. The first thing I noticed is just how smooth and responsive Samsung's is compared to Google's. 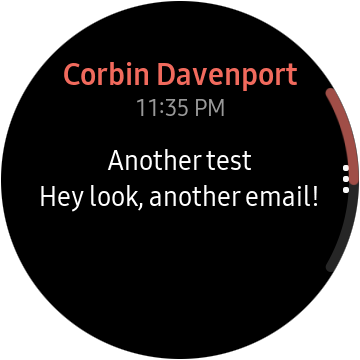 While performance and animations on my Fossil Sport are mostly fine, I never caught Tizen stuttering or lagging on animations in the way that I've seen on multiple Wear OS watches. It makes quite a difference in how the watch feels to use every day. 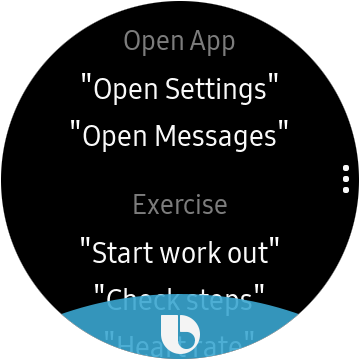 Tizen is organized with 'widgets' — pages accessible by swiping left on the main watch face. 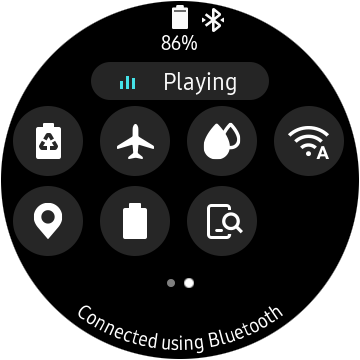 You can add, remove, and re-order widgets from either the watch or the Galaxy Wear app on your phone. I moved the music and calendar widgets to the front of the list, since I use those more than the fitness widgets. Just like Wear OS, swiping down from the top of the screen brings down a quick settings panel. 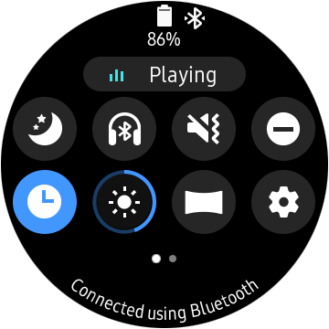 Here you can quickly control music playback, toggle the watch's radios, change the brightness, turn night mode on/off, and so on. There are a lot of buttons, and just like on Android, you can hide the ones you don't need. 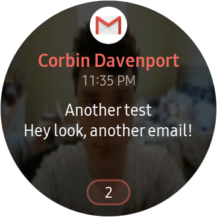 There are several parts of the system where the lack of a rotating bezel becomes obvious. 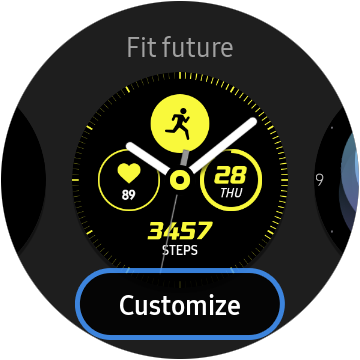 On previous watches, you could scroll through the list of apps (and see the name of each app) just by spinning the bezel. 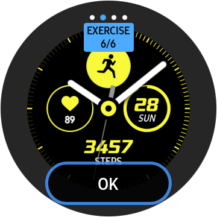 On the Watch Active, you have to tap one of the tiny app icons before you can see the name, and then tap again to open. Samsung could have done a better job of optimizing Tizen for this hardware. Speaking of applications, Tizen still doesn't have a decent library of third-party apps. Google Keep and Google Authenticator, which I use almost daily on my Fossil Sport, are obviously not available on Samsung's platform. An (official) Google Maps app is also missing. Spotify, iHeartRadio, Strava, HERE Maps, ESPN, and Tidal are the only high-profile third-party services I found on the Galaxy Store. I personally use smartwatches for notification management first and foremost, so I don't have to take my phone out of my pocket a hundred times a day. 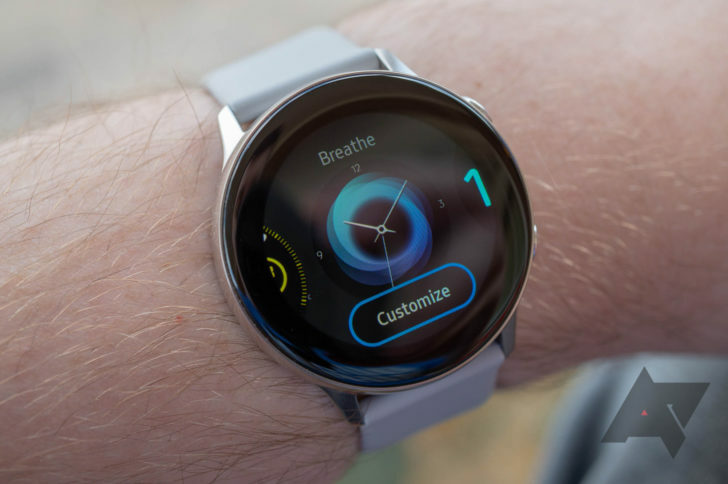 In this area, Wear OS wipes the floor with Tizen. 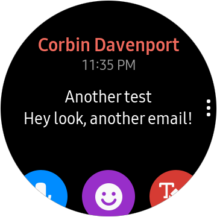 Tizen can display your notifications just fine, but performing actions (like archiving a Gmail message) requires more taps than on Wear OS. 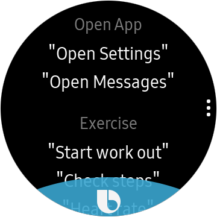 Accessing bundled notifications also requires two additional presses on Tizen. In short, anything except dismissing messages or replying with your voice is a chore on the Watch Active. 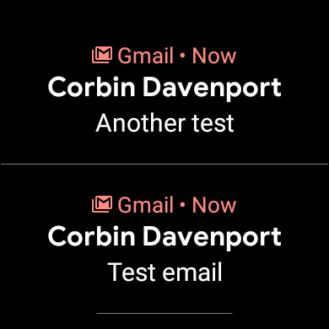 Bundled Gmail notifications on Wear OS are displayed as separate alerts, and one tap gives you access to quick actions. On Tizen only the latest message in a bundle is displayed — to access other messages you have to tap the tiny number at the bottom and then select the desired message. It's cumbersome to say the least. 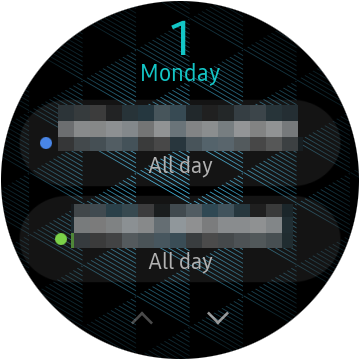 Tizen still allows you to reply to messages with canned responses ("Yes," "No," "OK," etc.) or your voice, just like Wear OS. 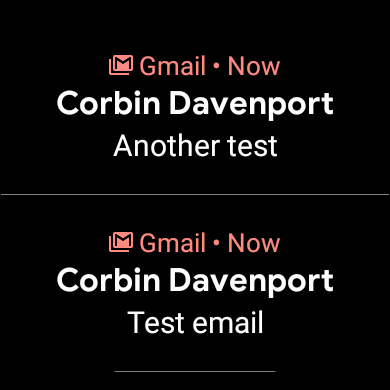 However, to access the buttons on notifications, you have to press the tiny menu button on the right. Yes, the voice assistant that everyone loves to hate is on the Galaxy Watch Active. 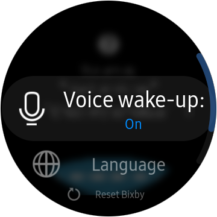 Google Assistant is perhaps one of the best selling points for Wear OS, but Bixby achieves just about everything I need out of a watch assistant. You can call or text contacts, show and set reminders, open watch apps, start a workout, set alarms, check the weather, or perform web searches. That covers just about everything I use Google Assistant for on my Fossil Sport, minus controlling smart home devices. 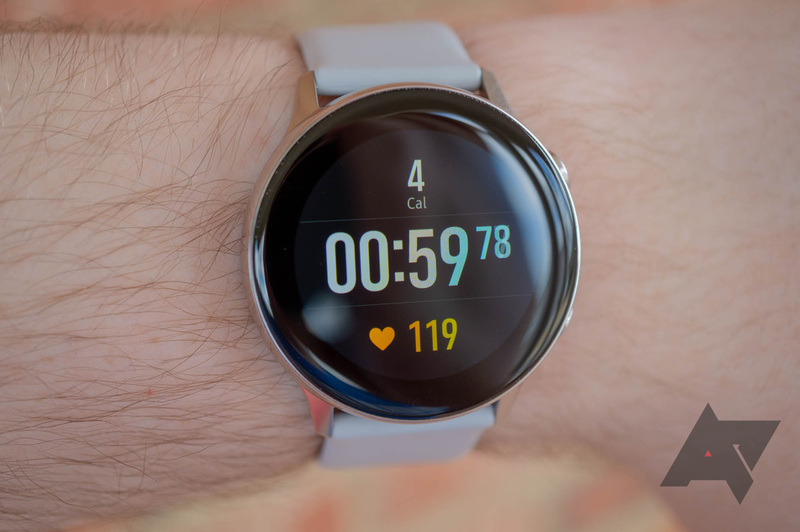 As the name (and all the marketing) implies, the Galaxy Watch Active is intended to be used for fitness tracking and health monitoring. 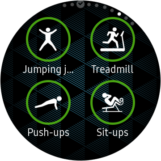 You can select from a wide variety of exercises in the Health app or one of the Health widgets, but most of my testing was just done on a treadmill. I also tried sit-ups, jumping jacks, push-ups, and other simple exercises, and found that the Watch Active's tracking was a bit shaky. 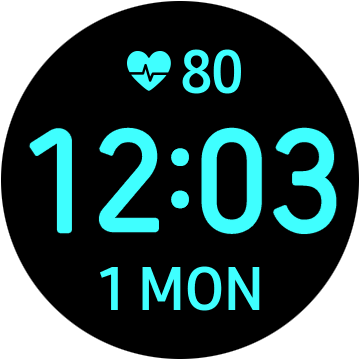 Sometimes it would correctly detect when I finished a set of 10 sit-ups, other times it would think I was still on the third or fourth sit-up. Beyond tracking exercises and checking your heart rate throughout the day, the Watch Active can also monitor your sleep. This is another area where Tizen's long battery life comes in handy — the watch usually only dropped 10-15% in battery after I had it on all night. 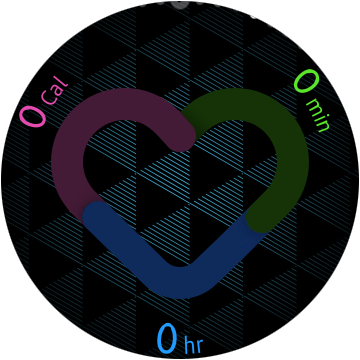 Granted, the watch was in 'Sleep Mode' (where the display doesn't auto-wake at all), but still very impressive. All health data syncs to the Samsung Health app on your phone. I wish Samsung would integrate their health data with Google Fit, but the company doesn't seem interested in doing that. Annoyingly, Samsung also likes to use the Health app for advertising — during most of my review period, there was a large Galaxy S10 banner on the main page. I guess spending nearly $200 on a Samsung watch wasn't enough? On a related note, the Galaxy Watch is also supposed to support blood pressure monitoring. However, this is currently limited to an opt-in study performed by the University of California, San Francisco (UCSF), and I wasn't able to try it out. Yes. The Galaxy Watch has a lot going for it, especially for (just) under $200. It has a sleek design, multi-day battery life, good fitness tracking (including 24/7 heart rate monitoring and sleep data), NFC payment support, customizable bands, and a mostly-solid software experience. There are definitely quirks and missing features, like the lack of a rotating bezel and speaker, but they aren't outright deal-breakers in my opinion. 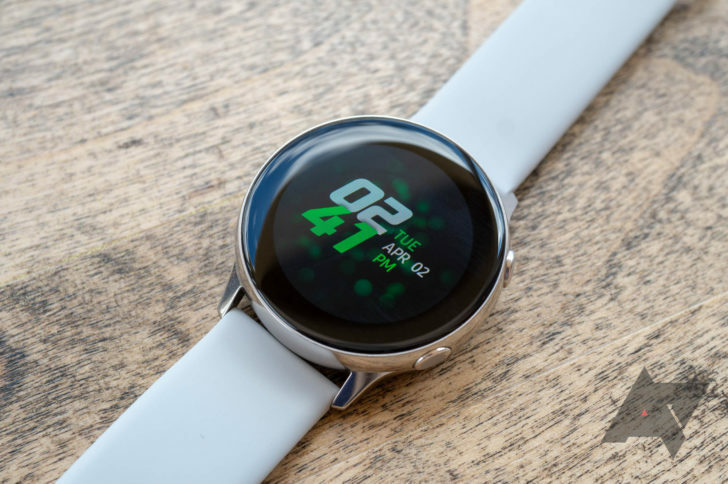 The Galaxy Watch Active is competing with other fitness-oriented smartwatches, like the Fossil Sport and Fitbit Versa, and dedicated fitness trackers like the Fitbit Charge 3. 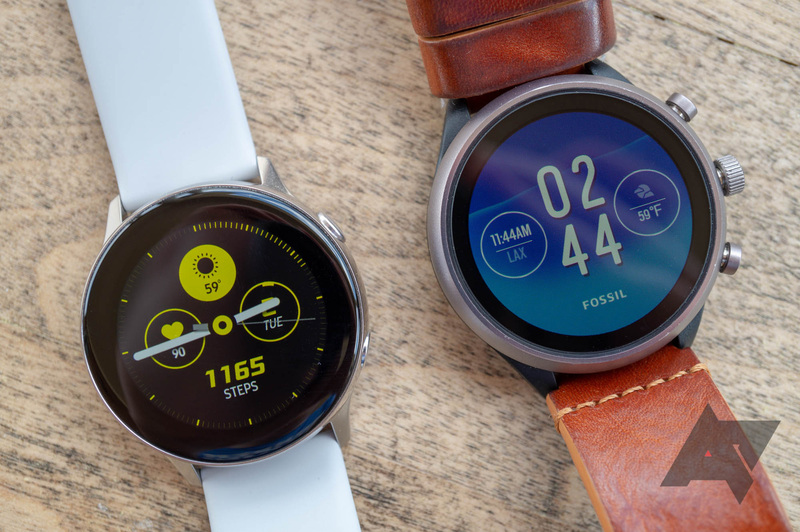 The Watch Active is definitely better at health tracking than the Fossil Sport, but I prefer notification management on Wear OS, and there are more third-party apps on Google's platform. I don't think anyone buying the Watch Active will come away disappointed, except perhaps long-time Tizen users who live and die by the rotating bezel. At $50 cheaper than the Fossil Sport, and $200 cheaper than the Apple Watch Series 4, the Watch Active is probably the best bang-for-your-buck smartwatch you can buy right now. 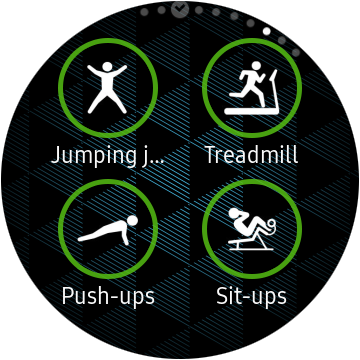 You want a smartwatch with fitness tracking. You don't need or want third-party apps. You can't spend more than $200 on a smartwatch. 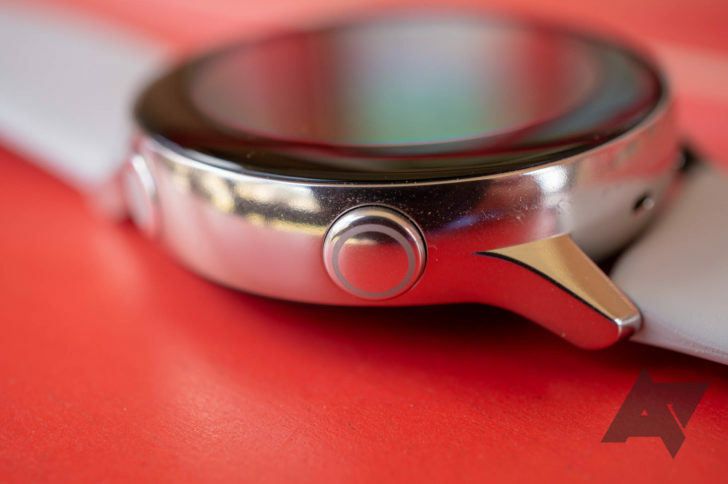 You like the rotating bezel found on other Tizen watches. 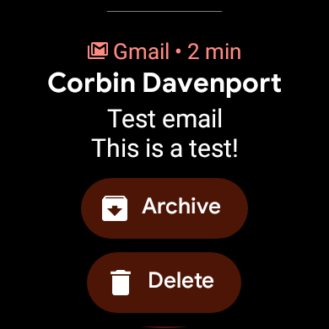 You want to easily manage notifications from your watch. You need something with LTE connectivity.